Whatever I have done in life I have always tried to do well; to be the best that I can possibly be. Now I recognise that there are lots of things that I’m never going to be any good at (foreign languages, clean manicured hands, nurturing plants ….) but that’s OK because they are not important to me. However teaching in my studio is important to me so I am striving to be the best that I can be. I have worked hard to organise and equip my studio so that my students have lots of space to work and so that they don’t have to bring masses of stuff with them. I have had great fun making colour wheels to help and guide my students. And I’ve worked through my lesson plans to make sure I have lots of relevant (and hopefully inspiring) samples. But I realised whilst I was at the Knitting and Stitching Show last weekend that I don’t have enough breakdown printing samples. Don’t get me wrong, I have metres and metres of fabric printed ready for the art I need to make for my solo gallery at next years Festival of Quilts but those fabrics are in ‘my’ colours and have been made using breakdown techniques that fit in with my personal inspirations. Not everybody wants to see rust and black fabric inspired by the decline in the cotton and mining industries. Strange but true. So this week I have been playing with other types of breakdown printing and with a slightly broader colour palette. I can’t quite bring myself to do pink flower inspired things or green landscape inspired things but I’ve had a thoroughly enjoyable time releasing my inner Jackson Pollock and squirting dye about. I may even let all my inhibitions go and print some screens at wonky angles. Blimey! Phew, with one day to spare I am already for the Knitting and Stitching Show at Harrogate. The show is open Thursday 22nd to Sunday 25th November and I’m going to be on stand TG626. Please stop by and say hello! There are lots of things to do to get ready for the show. I am there to promote my workshops so I’ve spent lots of time in front of the computer getting new courses ready and online. I put the last two up this morning. Print Your Palette (21st to 25th October 2019) is a 5 day deep dive into screen printing that is suitable for beginners but also a great opportunity of those who have done some screen printing in the past but want support to refine their knowledge and to learn how to put fabric through multiple layers of printing. The other course is a response to all those who need a little encouragement to actually use their printed and dyed fabric. Yes it is lovely to get our fabrics out of the cupboard to stroke them every so often but it is even better to see them hanging on a wall or laid over a bed! The workshop is called Print, Stitch, Go! (25th to 29th November 2010) and in it students will spend the first half of the week printing and dyeing a small set of fabrics which they will then use to design and sew a simple wall hanging or quilt. Suitable for people who have never printed or dyed before the workshop is designed as a fun, gentle 5 days of time away from the world. And in between all that computer work I have been dyeing fabric to sell at the show. This is an important part of the preparation as it, hopefully, provides a good contribution towards the cost of doing the show. And it’s so much fun! I’ve aimed for a good selection of colours, lots of ice dyed pieces and layer dyed pieces, and have enjoyed bundling together sets of fat quarters. Looking at the boxes of fabric there does seem to be quite a lot of teals and blues but also some really nice golden rusty brown pieces. Which happen to be my favourite colours - strange that! Not everybody loves breakdown printing or wants to use screen printing to create their cloth. 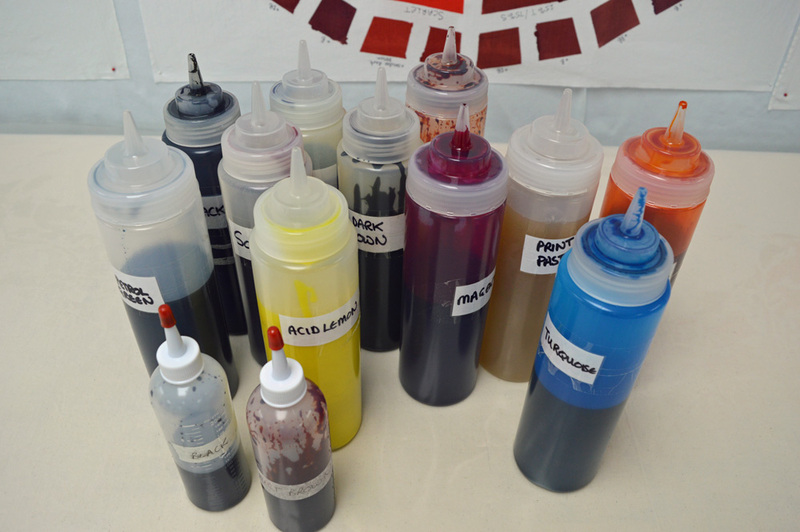 And so I have developed a second five day retreat, Colour Your Palette, that is focused on the addition of colour through dyeing, resist dyeing and the removal of colour using different discharge processes. Although most of the fabrics I have used in my work in recent years are breakdown printed I do include complimentary fabrics that have gone through dyeing and discharge processes. For me it is important to have a broad range of techniques at my finger tips so that I can select the technique that will give me the affect that I am looking for. The aim of this five day course is to create a palette of coordinated plain and patterned fabrics based on your own source of inspiration. 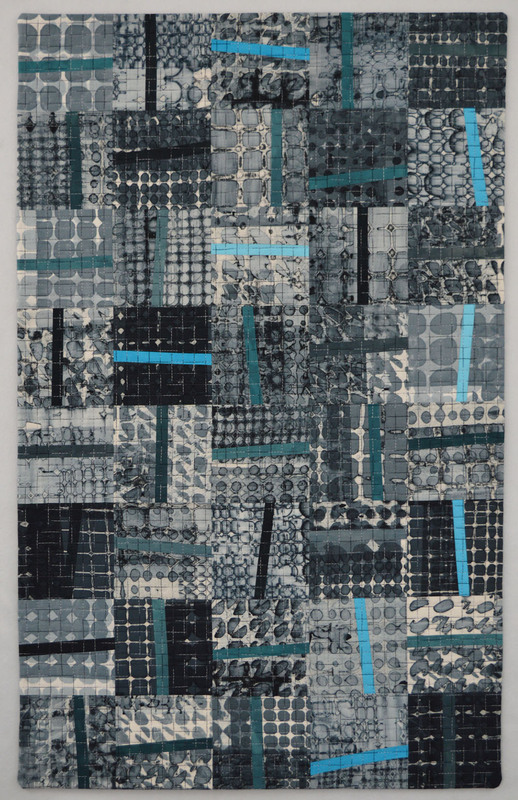 Students will be encouraged to create beautiful complex cloth by putting pieces through multiple processes. Where appropriate we may use other surface design techniques such as thermofax printing to add detail to our cloth. And, because I love colour, this course will be driven by colour - understanding how to mix simple and complex colours from primaries and working with a restricted set of colours or a colour family to create pieces of fabric that work together. We will exploit the transparency of Procion dyes by blending colour directly on the cloth as we put fabric through multiple processes. There are other ways to add colour to cloth that give lovely effects. 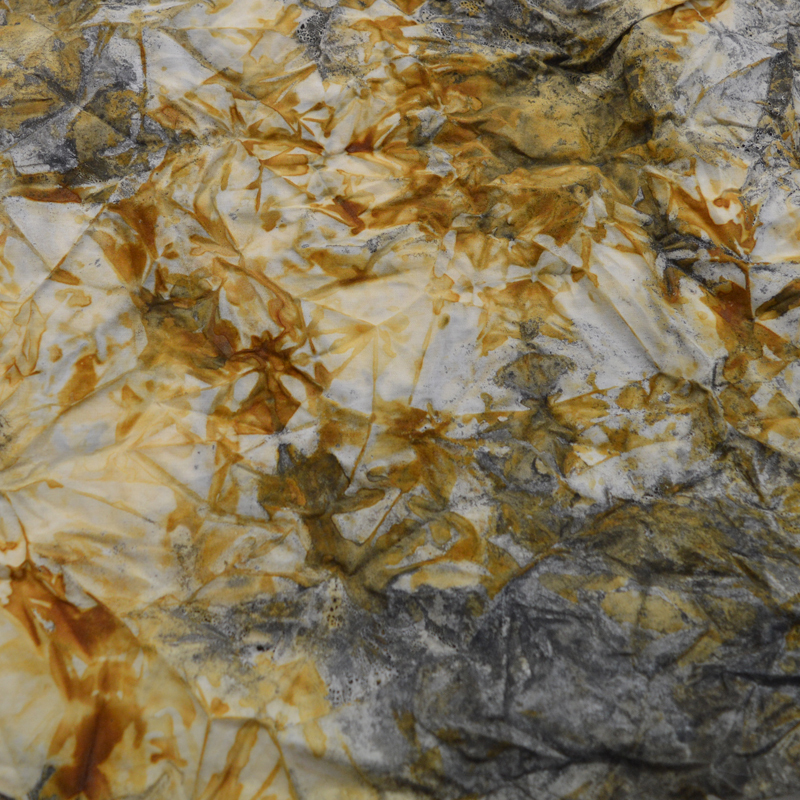 We will look at two alternatives during the five days - indigo dyeing and rust-like dyeing using Ferrous Sulphate - and how they can be combined with Procion dyeing. It will be a full-on, fun packed week. The studio will be a riot of colour and I can't wait! My new five day retreat Breakdown Your Palette is the course that I have been so wanting to teach! Those who read my blog or follow me on Facebook and Instagram will know that I love, love, love breakdown printing. It has formed the basis of my art for the last three or four years and will continue to do so. I love the serendipity of the printing process - I get marks that I could not get through any other method. I love the fact that every print I make is different. And I love the fact that, having spent 100's of hours making and printing screens, I have learnt new ways of creating breakdown screens; I have learnt to manipulate colour value and scale to influence the results I get and I have learnt to adjust my process to print whatever the weather conditions. Have a look at my earlier blog post here if you don't know what breakdown printing is. It is a simple process that can create complex, beautiful whole cloth that can used for clothing or as a background to stitch or it can be used to create a palette of cloth that can be cut and pieced. When I decided to start teaching I was cautious and only developed workshops for weekends, leaving week days for a 'proper' job. Which is a problem for teaching breakdown printing as the process involves letting your screens dry. Not an issue on a sunny day when screens will dry in a few hours outdoors. But very limiting on days when it isn't sunny. However having made the BIG decision to become a full time artist and teacher I have been able to develop a 5 day Breakdown Printing extravaganza! I have combined a deep dive into breakdown with my second love - colour. Understanding colour and using colour selectively is the key to creating a set of printed fabrics that work together. 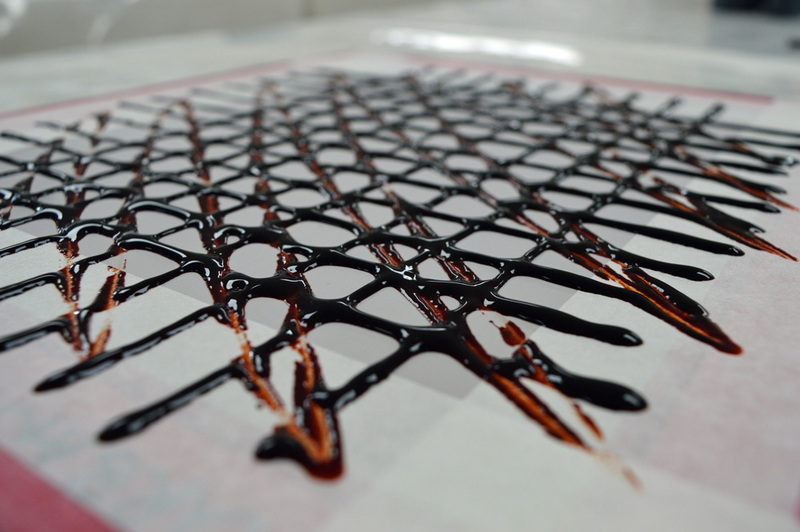 The course also covers using discharge paste to breakdown print which is such a useful process - it can be used to create complex layers of colour and texture and is a great tool for turning ugly ducklings into beautiful swans. And yes, I do still produce ugly ducklings occasionally! I started promoting the course at Festival of Quilts and had an amazing response. And I got to talk about breakdown for hours!! The two courses I have scheduled are now live and can be booked via my website along with my other workshops. There is only 1 place left on the 20th to 24th May 2019 course but I have more spaces on the 17th to 21st June course. I can't wait to teach this one - it is going to be so much fun.! Joe (oldest son, my gofer, and, he says, ace salesperson) - he is around here somewhere! And my spare day .... unless it is pouring down I'm taking my grandson to the beach and eating ice cream. I love colour! And whilst I've always kept records of the colours I've mixed for my art I have never taken the time to systematically create colour blankets. Until now. Colour is fundamental to the classes I am teaching so creating resources to help my students understand colour seems like an obvious thing to do. And it has been so much fun, I wish I'd taken the time to do this years ago! My favourite piece so far is the colour wheel above created by blending two primary reds - magenta and scarlet - and two primary blues - turquoise and royal blue. It's my favourite for two reasons. Firstly I didn't make any mistakes when making it but mostly because of the surprising colours you get when you mix scarlet with either of the blues. Instead of the 'purples' you might think you're going to get you get some beautiful browns. When you mix the two primary blues with two primary yellows - acid lemon and golden yellow - all of the blended colours are colours that you would label 'green'. No surprises but using the colour wheel I can see instantly how to mix an olive green or a lime green. 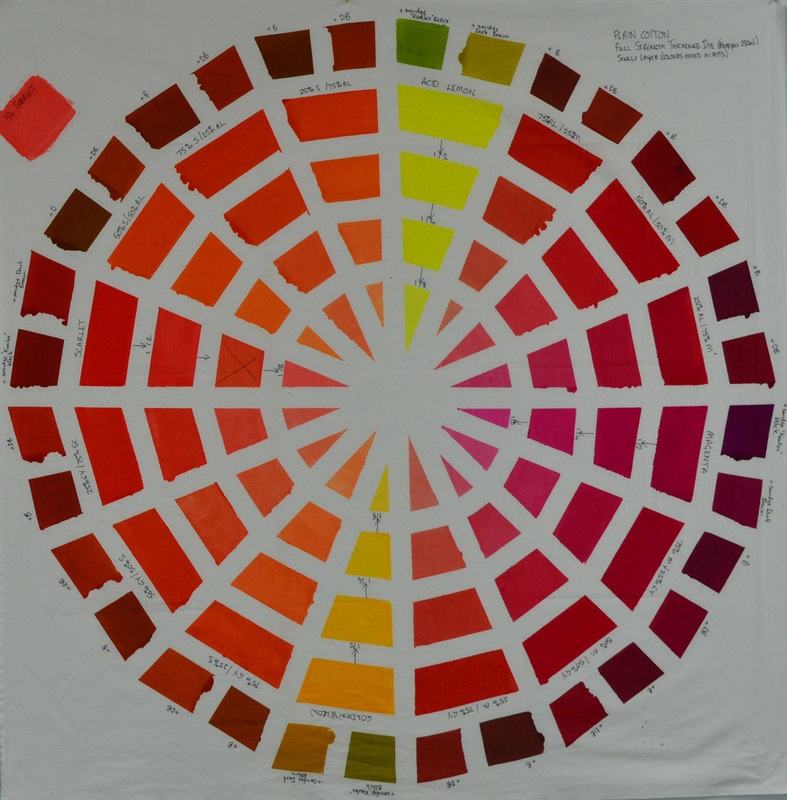 The third colour wheel mixes the primary yellow with the primary reds to create an abundance of oranges. What is interesting in this colour wheel is just how overwhelmed yellow is by red. Even a small addition of red creates oranges that are close to their red component. And finally (for now!) I have stolen an idea from the excellent DVD 'Exploring Fiber Reactive Dyes with Claire Benn' to create what Claire calls colour tartans. I have created exactly the same 'tartan' on two different cottons - the cotton poplin that I use in my art and a more open weave plain cotton. The colours are extremely close although they are very, very slightly richer on the poplin which has a slight surface sheen. Doesn't really show up in a photo so you'll have to trust me on this. Or make you own!